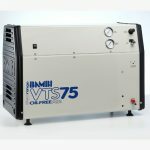 VTS75 silent compressors have the same features as the already very quiet VT75 Compressors, but is 18 dB(A) quieter. With its ‘tilting piston’ technology, the VTS75 provides the highest quality of compressed air with low noise levels, allowing it to be situated at the point of use. It is ideal for laboratories, dental surgeries, hospital ventilators, medical equipment and all other clean-air critical applications. 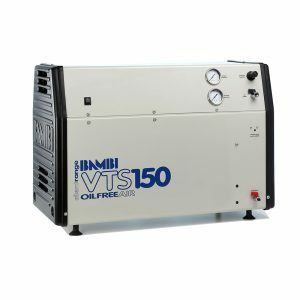 The VTS range is fitted with a “soft start” solenoid valve, which discharge the air pressure in the pump whenever the power is disconnected, thus protecting the compressor from overload. Its air receiver is internally coated, ensuring that the compressed air it generates is not contaminated. 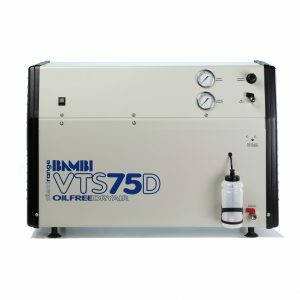 The Bambi VTS75 Silent Oil Free Dental Compressor is ideal for use in a 1 chair dental surgery (This is a guide only. Please check with dental equipment dealer re specific equipment requirements) or scientific laboratories, food packaging, pneumatic controls, hospital ventilators, drink dispensing and anywhere else where silent operation is essential. Ideal for when the compressor needs to be placed at the point of use. 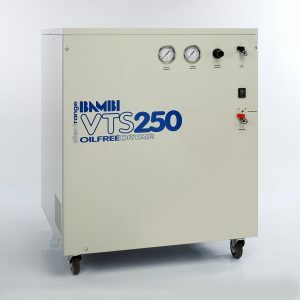 The VTS dental compressor range is inaudible when running. Thermostatically controlled sensors signal when the four coolong fans should run ensuring the compressor runs cool and keeping noise levels to their abosolute minimum. 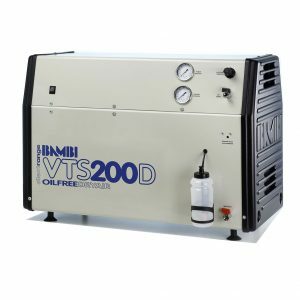 Available with Bambi’s innovative Air Dryer unit designed to guarantee “desert dry” air. The multi row, fan assisted after-cooler reduces the air temperature prior to entering the dryer. Dramatically reducing the air temperature enables the integral coalescing filter to collect and remove water droplets as small as 0.01 microns. Available on 12 monthly payments with 0% Finance. See monthly payment below.